DKE Toys continues to unveil its insane line-up of San Diego Comic-Con exclusive resin figures and their latest announcement has skyrocketed to the top of The Blot’s must get list! 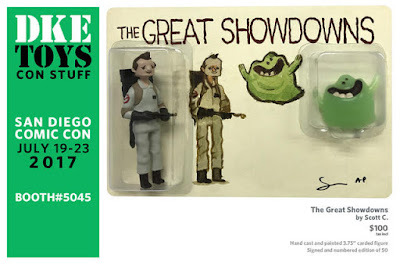 Check out the epic The Great Showdowns Ghostbusters Resin Figure Set by Scott C!!! The Great Showdowns are Scott C’s series of paintings, art shows, and books depicting classic pop culture good guys and bad guys. For Scott’s first The Great Showdowns resin figure release, he has teamed up with George Gaspar of Double G who sculpted these awesome Ghostbusters figures of Peter Venkman and a glow in the dark Slimer in Scott C’s signature art style. The San Diego Comic-Con 2017 Exclusive The Great Showdowns Ghostbusters Resin Figure Set by Scott C includes two hand cast and hand painted resin figures on a full color blister card signed by the artist. Limited to just 50 sets, collectors can purchase this limited edition exclusive at the DKE Toys SDCC booth #5045 for $100.